Hammer Toes: The first joint of the toe (proximal interphalangeal joint is bent and sticks up. 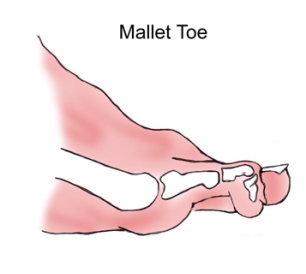 Mallet Toes: The second joint of the toe (distal interphalangeal joint) is bent and the tip of the toe points down. Claw Toes: Both joints of the toe are bent. The first joint sticks up and the tip of the toe points down. 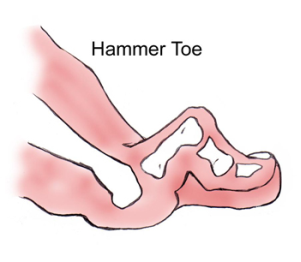 Most people who seek care for Hammer Toes have pain either at the top of the first joint or the tip of the toe. Often patients complain of painful corns. Occasionally people with hammer toes also have pain under the ball of the foot. Not all Hammer Toes are painful. Occasionally people seek treatment because of appearance. Many people seek treatment because of fear that their toe deformity will get worse and become painful without treatment. My toes used to look normal.ï»¿ Why do I have Hammer Toes now? Flexor Stabilization: Patients with low arches have unstable feet and their toes grip the ground when walking. Over years this can lead to hammer toes.This is the most common cause of Hammer Toes. Extensor Substitution: Patients with tight calf muscles hyperextend their toes when walking. Over years this can lead to Hammer Toes. Flexor Substitution: Patients with weak calf muscles develop Hammer Toes from using the toe muscles for stabilizing and pushing off when walking. This is the least common cause of Hammer Toes. Hammer Toes are often caused by Bunion deformities. As the great toe pushes on the second toe, over time ï»¿the second toe buckles and becomes hammered. Patients with Diabetes are also more likely to develop Hammer Toes. How do you diagnose Hammer Toes? How do you treat Hammer Toes? What surgery options are there? For more information on Hammertoes in the Casa Grande, AZ area call Foot and Ankle Center at (520) 836-2962 today!